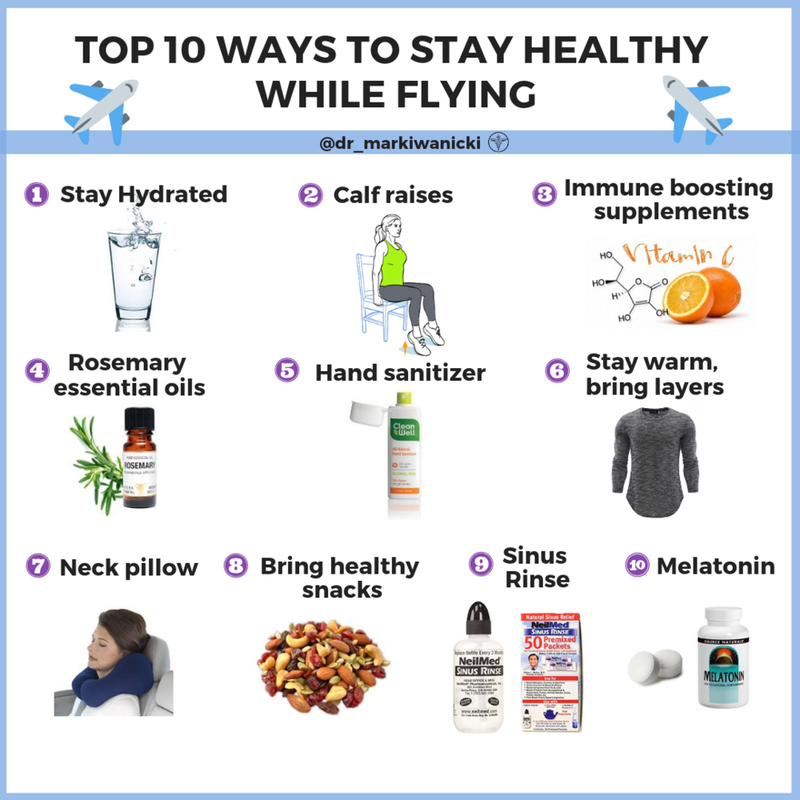 Stay hydrated-Drinking lots of water is critical while flying. Airplane air is very dry and easily depletes us of essential moisture. Compounded by the hours of traveling and running around when we simply forget to drink enough water our bodies become depleted fairly quickly. If you are drinking alcohol or caffeine make sure to up the water intake even more as these liquids cause us to excrete more fluids. Seated calf raises-Sitting in one place for a long time can lead to blood stasis in the leg veins which predisposes us to DVTs (Deep Vein Thrombosis) which are clots of blood that form from stasis in the legs. If dislodged these clots can move into the lungs causing Pulmonary embolisms. The easiest way to combat this is to move around as much as you can and do seated calf raises while in your chair. Compression stockings may be a necessary further step if you have a personal or family history of DVTs. Going for a long walk or run after you land is also a great way to get the blood moving and relieve stagnation. Qi-going shaking practices are great as well. Immune boosting supplements-Certain substances are known to boost our immunity and raise our defences against viral and bacterial pathogens. Although not fully embraced by the conventional medical community these supplements are safe with no side effects (at standard doses) and I believe should be included in a healthy travel regiment. Zinc-Boosts immunity and is a powerful antioxidant. Vitamin C-Boosts immunity and is a powerful antioxidant. ViraCon-Combination of herbs and minerals that are antiviral. Sambucol-Elderberry extract. Antiviral and studied to be as effective as TamiFlu. Echinacea-Boosts immunity. Purpurea species shown to be more effective than Angustifolia. Mucococcinum-Homeopathic flu remedy. Works like a safe vaccine stimulating our natural immune response. Notasan, Quentasan-Homeopathic bacterial and viral support remedies. Act like immune adaptogens helping to modulate immune system function. Rosemary essential oil-Rosemary is a powerful antimicrobial essential oil. It can help kill airborne bugs. Place 1-2 drops on a napkin or tissue paper and wipe the fresh air spray that is above your seat with it. That way you are receiving a constant blast of antimicrobial essence while you sit there. Lavender, thyme and oregano are also good antimicrobial options. As a side benefit you’ll be helping the whole cabin. Hand sanitizer-Make sure its alcohol free (ex: Cleanwell organic Thyme based sanitizer). Alcohol can be very drying and harsh on the skin. You can use your sanitizer to disinfect your hands and also to spray down your seating area and lock down tray. Remember to wash hands often with regular soap as well. Stay warm, bring layers-Planes can be cold places. Way up in the air its always cold, even in the dead of summer. Thats why its important to self regulate your temperature with layers. Neck pillow-Can be helpful in stabilizing your neck if you are in a seated position for an extended period of time. They can help relieve neck pain and cervical chain compression. More critical for longer haul flights in economy seating. Bring healthy snacks (fruit, veggies, hummus, protein bars, nuts, seeds). Not every airline feeds you so having healthy snacks in your bag for those emergency drops in blood sugar is essential when traveling. Sinus rinse-Saline sinus rinses once you get to your destination can be a great way to rinse your nasal cavities of the bugs you picked up on the road. Sinuses can harbor bugs for a long time so keeping them clean and clear can be a strong preventative from fully developing an illness.